Certainly, Orlando can satisfy the desires of all golfers, especially snowbirds or vacationers escaping their winters or hectic schedules. 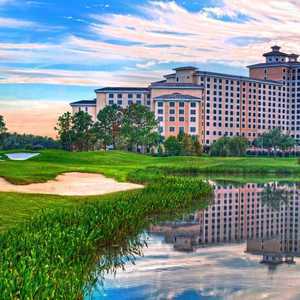 With that in mind, here are some golf courses in the Orlando area that are not only extremely playable but also offer superior layouts, conditioning, service and amenities. "Shirley Temple" is the cute and sprightly first hole at Celebration Golf Club. In a town developed by The Walt Disney Company, Celebration Golf Club is the collaborative effort of Robert Trent Jones Sr. and Robert Trent Jones Jr.
Set amid pines, oaks, magnolias and wetlands, the Joneses have created a lush, scenic playground dedicated to "celebrating golf at every level." As the elder Jones said, "With the beauty of the course, the design ... everyone will have fun because it can be enjoyed here on many levels." Each hole has its own name, starting with "Shirley Temple," the relatively easy first. The par-5 fourth is, "Will ye or won't ye" go for it in two. The backside includes "The Houdini," the tricky par-3 16th, and the closing hole is, "Keeping up with the Joneses." Golf Digest has recognized Celebration Golf Club as one of the best-designed golf courses in Florida. Managed by Marriott, Falcon's Fire Golf Club also keeps up with the Joneses -- Rees Jones in this case. This stylish championship layout is a favorite with residents and tourists. The course is always in impeccable condition with generous fairways and true, fast greens. "Falcon's Fire is golfer friendly," Golf Professional Austin Swanger said. "It won't beat you up. The course sets up fairly open off the tee and is a fair test from beginning to end." The front nine is golfer friendly and should build a player's confidence. Starting with the long par-4 12th, however, the course brings out its talons, and the remaining six holes are excellent tests of shot placement and putting accuracy. Located outside the hustle and bustle of Orlando, the motto at Harmony Golf Preserve is, "Nature calls you home." That reflects both on Harmony's certification as an Audubon Cooperative Sanctuary and its commitment to protecting the environment. Built on 260 acres of wildlife preserve, this Johnny Miller design wends its way away from home sites and into the verdant natural landscape. Besides keeping his eye on the golf ball, a player will also see turkeys, otters, sandhill cranes, bald eagles, deer, ospreys, hawks, bass and turtles in their habitats. Operated by Troon Golf, the Harmony Golf Preserve combines a welcoming staff with a world-class layout. Each hole is distinctive and requires vision and strategy. "We have a unique layout," said Todd Van Meer, the head golf professional at Harmony Golf Preserve. "It's pleasing to play and is a reasonable test for all golfers. Plus, we have awesome wildlife." 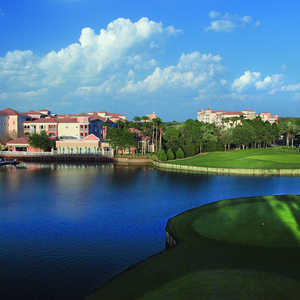 Orange Lake Resort, home to Holiday Inn Club Vacations, sports The Legends Course and The Reserve Course. Arnold Palmer designed The Legends, and it is acknowledged as one of Orlando's best golf courses. Palmer treats the golfer to two markedly different nines. The Links has wide open fairways and deceptively contoured greens, similar to traditional Scottish courses. The Pines returns the golfer to North Carolina with its blend of huge pines and oaks, twisting fairways and water hazards. Multiple tee boxes guarantee a course length that all skill levels can enjoy. Palmer also designed Legends Walk, a delightful nine-hole, par-3 walking course that is entirely lighted for night play. The Reserve, originally designed by famed architect Joe Lee and then renovated in 2005 by Mike Dasher, emphasizes the relationship between the course and its environment, the surrounding wetlands rich in native flora and fauna. The shortest of all six courses at 6,500 yards and a par 71, The Reserve doesn't need length to impress the golfer, who still has to negotiate the prevalent sand and water and then has to read the rolling greens. Dasher took his skills down the road to create Providence Golf Club, one of Orlando's best-kept golf secrets. Upscale from the bag drop on, the links-style course opened in 2007 to critical acclaim. Dasher wrote, "I would characterize Providence as a hybrid course, part prairie style, part old Florida, and part parkland. All in all, the variety of style and tree canopy throughout the course creates an ever-changing pallet that will provide for memorable holes as well as strategic golf." Thirteen of the holes venture into undeveloped, natural territory and through creeks, towering hardwoods and wetlands. So, what Dasher really means is that the golfer gets another unusual but immensely satisfying experience. As should be expected with exemplary clubs, all of these golf courses have outstanding clubhouses and amenities, such as extensive practice facilities, grill rooms and/or dining rooms, locker rooms, private lessons and/or golf academies and beverage carts.